Cats chat with each other, and with us, all the time. It’s just that we don’t hear them. While our native language is spoken, cats communicate with their scent, their eyes, their tails and even with their whiskers. To eavesdrop on your cats’ conversations, all you have to do is watch them. Their body language will tell you everything you want to know. To help you understand how cats communicate, here’s a glossary of catspeak for you. Mother cats and kittens meow and chirp to each other, and cats meow at us when they have something to say because they know we don’t understand their native language. While “Meow” is baby talk to them, it seems to be the only word they say that we understand. And what about the words we say? Some experts think cats have a human vocabulary of 250 words, or even more. And even when they don’t understand exactly what we’re saying, cats do pick up on our thoughts. 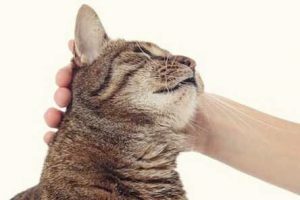 Cats purr at a frequency of about 26 Hertz. That’s a range that promotes tissue regeneration and healing. If you’re feeling achy, curl up with your cat and discover the amazing power of the purr. Have you ever noticed your cats blinking at each other, or at you? That fluttering half blink is a cat’s way of saying “I love you” or at least offering to be your friend. Partly closed eyes are catspeak for “I trust you.” Touching noses, raising the tail in greeting, rubbing faces and grooming are other ways cats communicate affection or friendship. Humans yell when they’re irate. Cats stare at each other in angry or suspicious silence. That fixed, hostile stare is a sign of aggression and could mean a fight is brewing. Hissing, growling, spitting and yowling are all ways cats communicate aggression, but veterinarian and animal behaviorist Nicholas Dodman thinks they might communicate different levels of aggression or fear. Hissing and growling signal mild irritation or a warning by one cat to another to leave its territory. Spitting and yowling, Dr. Dodman says, indicate that the cat has reached “the boiling point.” Some experts believe the hiss mimics the sound of a snake, and most cats fear snakes. A stiffly-held body with the head down and the rump up is one cat’s way of telling another he’s looking for a fight. An open-mouth threat is a serious warning, too, Dr. Dodman says. Dilated pupils, flattened ears and a puffed up coat and tail are also signs there’s about to be a fight. But Dr. Dodman thinks those are not conscious signals of aggression. “Dilated pupils emit more light,” he says. Puffed up fur makes the cat look bigger and more threatening than he really is, and the ears are flattened for protection during battle. 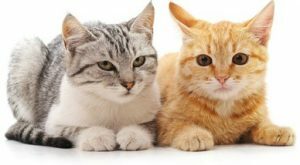 Most cats will do almost anything to avoid a confrontation, and cats often resolve their disagreements by starring each other down. As things cool off, one will tell the other he doesn’t want to fight by looking in another direction, yawning or grooming himself. The cat’s body language lets his adversary know he can leave the battleground without losing face. A cat who wants to be left alone by an aggressive house mate will crouch, trying to appear small and nonthreatening. If the cat’s body language goes unnoticed and he still feels threatened, he’ll turn over on his back so he’s ready to use his powerful back legs in a fight. While cats usually hide their illnesses and pain, a cat in acute pain may scream. To humans, this is a distinctive, chilling cry and sounds very different from the aggressive or fearful yowl. To humans, yawning often signals boredom. in catspeak, though, a yawn sends a relaxed, reassuring message. When cats communicate, scent sends a powerful message. It’s one way of letting the world know this chair or fencepost is mine, all mine. 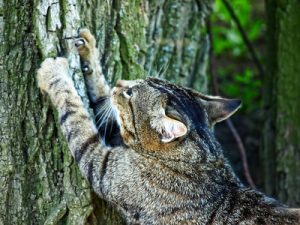 Why does your cat claw furniture or that tree in front of your house? He’s leaving visual signs of “ownership” with his claw marks. The scent glads in his paw pads reinforce the message that that chair and tree belong to him. Unappealing as it is to humans, cats communicate ownership with their feces and urine, too. Kittens meow to their mothers when they want something. And a mother cat chirps to her kittens when she wants them to follow her. In catspeak, purring is reassuring and lets the mother cat and kittens know all is well. 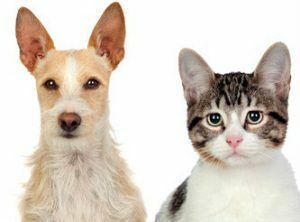 Do Cats Communicate With Dogs? Cats and dogs don’t speak the same language, but they come close. Like cats, dogs communicate with scents and body language. So a cat and dog who live together can usually communicate with each other without needing a translator. Another way cats communicate with us is through our hearts. And those heart-to-heart conversations are the best cat chats of all. Sit with your cat and clear your mind of everything except what he has to say. You might learn something surprising and wonderful.